An orchestrated premonition: a careful and soulful balance of synthpop melodies and baritone drum rolls, an inspiring cacophony of moods and tonalities that all fit together like a shiny chrome puzzle set. That’s the synthesized glory of The Avalon Hi-Fi the best that it can be summed up. Atwood Magazine is proud to premiere the Brooklyn-based band’s debut EP, There In The Dark, a journey through a future not yet tangible. 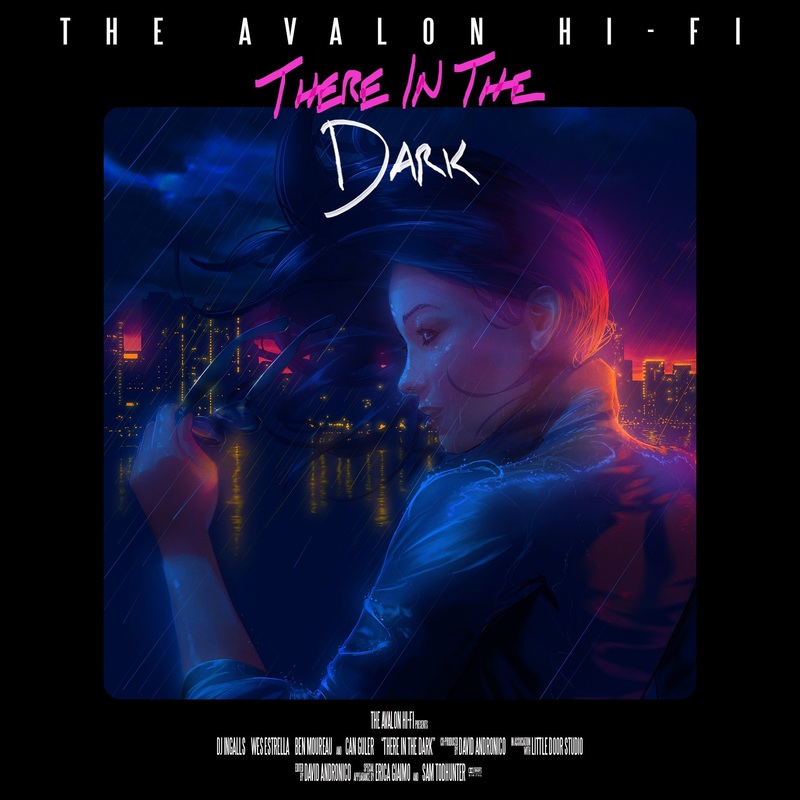 Everything here has a purpose, and, nostalgia-driven and unabashedly sincere, The Avalon Hi-Fi has definitely brought something new to the musical conversation with this masterpiece of a pop album. A stellar synthesizer hum that seems to rip apart the night sky in a hopeful power-pop fireworks display is what There In The Dark opens up with, and it definitely leaves an impression, an impression that’s tough to describe — a first track, the title track, so fitting of the rest of the album that it ceases to be an individual song, more like a score or theme. A Chariots of Fire for the technological singularity, maybe, or just the soundtrack to a night walk in neon-stricken New York City, “There In The Dark” offers a unique balance of fuzzy lyrics and cosmically graceful chords that wonderfully conveys the details and intricacies of The Avalon Hi-Fi’s signature sound: feeling everything at once, and being okay with that. It all feels like a hazy, 80s-themed fever dream — but perhaps the phrase that best explains the apparent vision behind the There In The Dark EP is “operatic”. The oscillations dreamt up by band members DJ Ingalls and Wes Estrella turn the simple driven LFOs of a synthesizer and a pedaled guitar into textured rhythms that tell their own tale, a story of late night partying, a dissociated rave, stories upon stories, a life respoken. We see this weaving of an epic in the second track on the album — a deep house boutique of a song that tells the tale of a hue of a lady, “Naomi Indigo” is about a love that was lost but through cybernetic woe continues to be harped upon. Rhythmic drones and rolling arpeggios provide the basis for this pop rocker, a headphone-blasting muffled jog through the rainy set of some early MTV music video. With a rapid-fire chorus and powerfully funky cadence, it carries itself an inspirational romp that incites one to dance in joyous revelry of the aforementioned woman and just about primes us for the next song. “She (The Silver, The Summer)”: The Avalon Hi-Fi has a thing for the appeal of femininity. The third track on this ever-evolving EP is a tribute to a muse — not a love missed out on but a love dearly missed, a search for the beauty of Selene in a world of the cherished sun. Lyrically and musically this tribute to the night seems in its own concordant, multi-voiced way to pick up where the last track left off, with a resounding guitar reverberation of retro sentiment; for what is embracing the technicolor millennium without paying homage to things past? LIke our glam-rock past, however, it feels distant. “She (The Silver, The Summer)” speaks of a girl far away as the moon in the night sky, a heavenly body known but unknown to the heartfelt narrator of this celestial rock ballad. There are things and lost hearts out there we will never reach: but it still feels necessary to miss them. We must move on, however, and it is thus that the almost cinematic brilliance of There In The Dark progresses. The progression of an album partly relies on a group’s ability to be dynamic and to reimagine themselves without straying from their core style, and The Avalon Hi-Fi does this again and again with incredible success each time. There is a balance that must be maintained, however: they must show mastery of their craft, and of their roots. 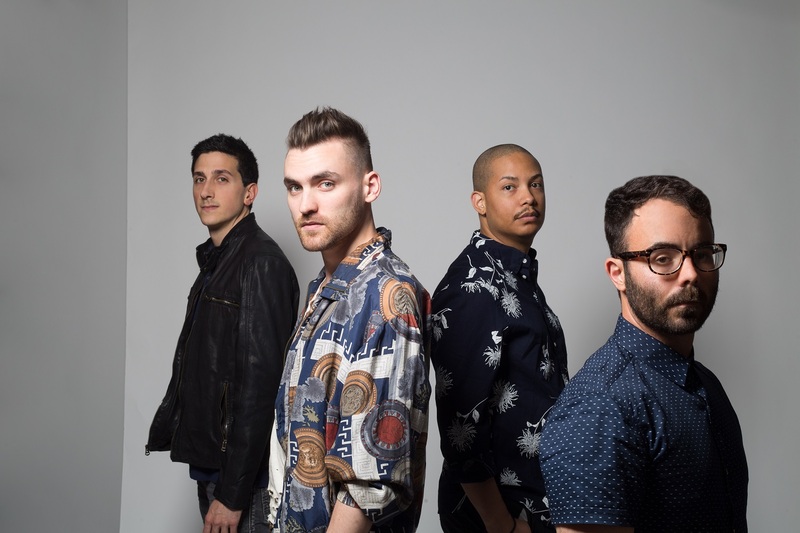 This melancholic balance is seen best when, musically, the group manages to bridge the gap between the decades they take their inspiration from, as is apparent on track “The River”, a low-key synthpop song as striking as its predecessors but with the catchy hook of a modern alt-rock banger. It stands its ground as one of the best individual tracks on the album and perhaps acts as the “climax” of this groovy cyberpunk concerto, recalling the vocoded vocals of the first track and tying up all the plot threads. The narrator’s passionate search for love has come to a final close with this song, and it’s all faded sentiments and clashing eulogies from here on out. Really, that’s just the way it should be. A true concept album. From this glorious peak comes a heartfelt remembrance of the blast of sound that was this powerful booming rock opera. 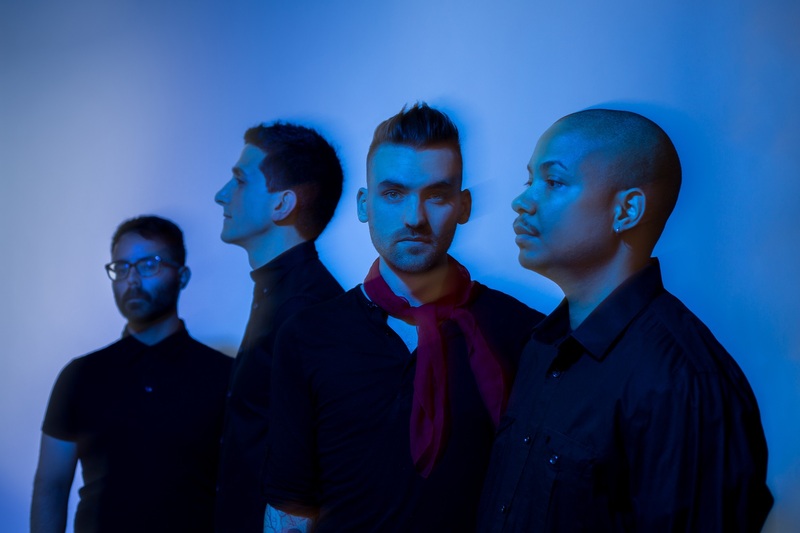 The first single off of There In The Dark, “Eternity Now”, features cool wistful triads and fast-paced melancholy vocals that stand in friendly contrast to the almost symphonic tracks that came before it, winding down away from the tumultuous climax that was “The River”. It’d be nice to assume that the narrator so yearning and lost has at last found his cosmic moon-lady, his muse of Selene, and that the cosmos are quite alright tonight as they dance. Whether or not that’s the case, this track is a happy one. Constellations resound and hearts become one here as the narrator embraces true emotional bliss, perhaps busting a move like some starstruck Lionel Richie or dancing in the heat of a warm summer night. It’s all about letting go, freeing oneself from the baggage of worry and letting primal joyous instincts take over, realising how much one’s own emotions are worth: perhaps reaching out in some metatextual way to the listener, telling them to really listen, to realise that these songs are for the them. The narrator is the listener and yet he is speaking to them all the same. Sharing experiences through music. Maybe that’s what this album is all about: searching for something new and finding that it’s been inside you all along. All that being said; this album is not done. There is yet a denouement to address, a final tune to embrace the revelry of the search for joy: a Reverie. This final track, of that name, “Reverie”, is a striking piece of poetic metre and in its staccato grace, pure, sublime, we here at Atwood can only recommend you listen to it for yourself. There are very few bands that can pull something like this off and The Avalon Hi-Fi stands among them. And so it ends: in superimposed text, There In The Dark fades onto screen. Cut to black. Credits. Standing ovation and uproarious applause. What will you take from it all? This is the intro, the ‘lights up.’ We thought we could give ‘shape’ and structure to the EP by giving it an intro and an outro, a la film. The first track introduces the ‘heroine’. She can represent a number of things to different people, but ultimately she’s the repressed emotion of society as well as the object of the listener’s affection. I sing as a narrator of sorts; introducing and giving exposition to the dynamic between the listener and the ‘heroine’ throughout the record. This one is about love that was missed out on. About being honest with your intentions and being okay with not knowing. Lots of Michael Jackson influence. This is the arcade synth pop track we knew we needed to have. There’s such a nostalgia to those pulsing synth bass lines and warm chords. I personally wasn’t alive in the 80s, but the magic still exists for me when I hear those sounds. That instinctual connection reminded me of a girl I knew once who made me feel the same way. Like I knew her without knowing her. And I never did end up knowing her. We like this one because we feel it’s the “middle” of our spectrum between 80s pop and alt rock. It has a good amount of both and the vocoder bit in the bridge attempts to tie the sound back to the intro and tie the elements together. Everything ends with another alt rock – synth piece. The narrator speaks more directly to the listener and tries once again to be direct this time about recognizing how much his emotions are worth. The ‘heroine’ herself speaks and pleads similarly.